Indoor air is rich on volatile organic compounds (VOCs). Large indoor concentrations and complex cocktails of these numerous, mainly synthetic, VOCs make them a threat to human health. In fact, many of the VOCs have been labelled as category 1 human carcinogens. Myriad of different filtration technologies exist to fight VOCs, but they are often expensive, may be selective for a range of VOCs or produce harmful by-products. 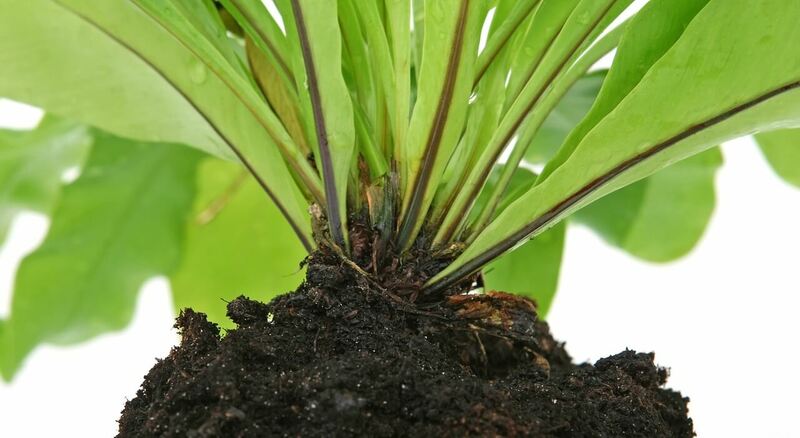 Botanical biofiltration technology, due to advances in technology and design, provides a promising solution to effectively remove pollutants from the indoor air. In the current study, Naava One system (NaturVention Pty, Jyväskylä, Finland) placed in an EU standard test environment showed significant biofiltration capacity, averaging in almost 57 % single-pass removal efficiency. The Naava system is based on two functional components. Firstly, an inorganic growing media supports plant viability, along with activated carbon assisting in water retention and VOC removal. This growing media essentially acts as a biofilter through which ambient indoor air is drawn with an integral electric fan. Secondly, the system holds 63 plants which grow horizontally from circular, individually replaceable, compartments in the front vertical face with 150 × 100 cm in area. Popular indoor plants that are easy to maintain were selected to the Naava, irrespective of their documented biofiltration capacity. Test were conducted as a triplicate in a standardized 30 m 3 EU test room (CEN/TS 16516, CEN/TS 2013) with controlled measureable inlet and outlet for gases thereby making it possible to accurately measure the incoming and outgoing VOC concentrations. Room ventilation rate of was set to 1.67 air changes per hour for the room and the air flow through the plants was set to 50 cubic meters per hour. Inlet and outlet air samples were collected with TENAX tubes and quantified by automated thermal desorption and gas chromatography. MEK, i.e. 2-butanone or methyl ethyl ketone, was used as the test VOC. MEK is commonly found indoors as it is a common compound in textile and plastic manufacture, and outgasses also from printed and painted materials. Exposure to MEK vapour causes upper respiratory tract irritation at 100 ppmv, and severe symptoms including paraesthesia already at 300–600 ppmv. Experimental conditions mimicked possible indoor air conditions with 33.9 ± 0.54 ppbv of MEK that was reduced to 14.7 ± 0.30 ppbv with a single pass through the Naava biofilter. This gives a single-pass removal efficiency (SPE) of 56.6 ± 0.86 %. For more elaborate comparison this removal rate can be transformed into commonly used clean air delivery rate (CADR) which describes the airflow from which the chemical (MEK) has been removed: 18.9 m3 h−1 m−2 green wall area. 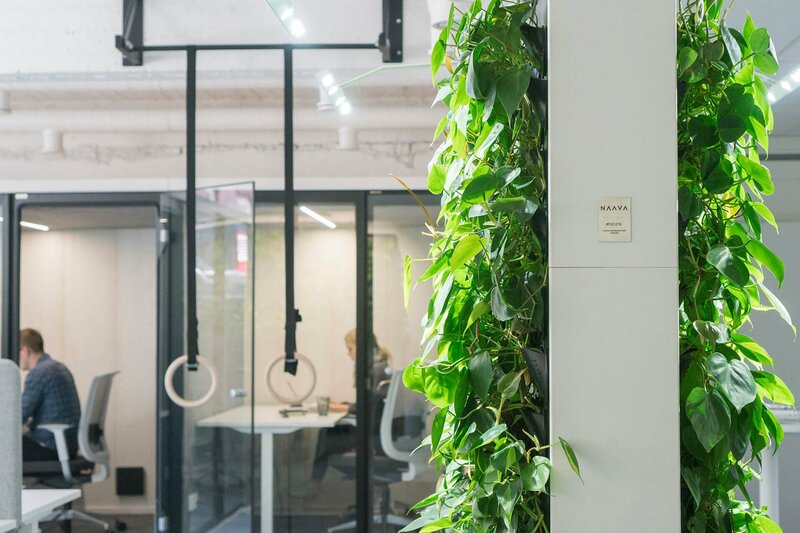 With the 1.5 m2 total Naava green wall area this would provide one CADR equivalent air change per hour for a room of 30 m3 demonstrating that Naava green wall is an efficient phytoremediator.